The British sprinter had been unknowingly racing and training with the virus for months. Mark Cavendish, one of the most accomplished sprinters in pro cycling, is taking a break from the sport due to an infectious virus, CNN reports. Cavendish, who won the 2011 Road World Championships and boasts 30 Tour de France stage wins in his career, was diagnosed with the Epstein-Barr virus, according to his Dimension Data team. The Brit had unknowingly been racing and training with the virus over several months, and his team told him to stop riding until he recovers entirely. “As a result of these findings, [Cavendish] has been advised to rest in order to fully recover ahead of a return to training,” a team statement read. Last year, Cavendish was diagnosed with mononucleosis (commonly known as mono), a glandular infection caused by Epstein-Barr. He put in a poor performance at the Tour de France in July, leaving the race after getting time cut on Stage 11. William Shaffner, an infectious disease specialist and professor of preventive medicine at Vanderbilt University, said Epstein-Barr is usually harmless, but can result in symptoms that would hurt one’s cycling performance. Symptoms can last for up to a month, which is why it’s important for Cavendish to rest. There’s no official word on when Cavendish will return to racing, but Shaffner said it could take at least a month before he’s ready to get back on the bike. Cavendish holds more Tour de France stage wins than any other racer except Eddy Merckx, who has 34. He took the green jersey in the points classification at the 2010 Vuelta a España, the 2011 Tour de France, and the 2013 Giro d’Italia. 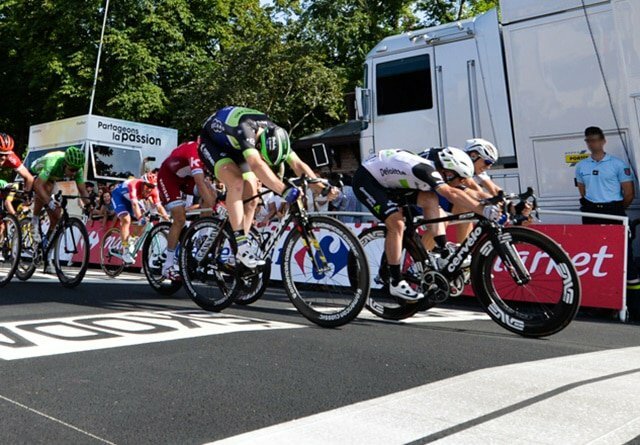 Next to Peter Sagan, he is perhaps the biggest sprinter in pro cycling right now. Cape Epic Finale: Scott-SRAM MTB-Racing Cruise To Overall Victory!